Falling Hard for Sofft: The Boots Say Style. The Feet Sigh Comfort. 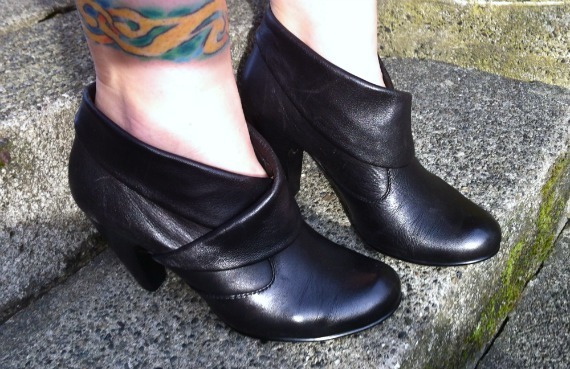 Last week, I decided to keep these Sofft leather booties, and I am so glad I did. I can't believe how incredibly comfortable these shoes are! They are a stylish mid-heel, with padding in the interior, adding cushion to the balls of the feet and a slight arch support. They are leather inside and out, and are so breathable that my feet felt just as fresh at the end of the day, as I felt at the start. With their style savvy, quality construction and smart design, its easy to see why I've fallen hard for Sofft. Super CUTE!!! I love that style and have always found Sofft shoes to be very comfortable. I'm a fan of Sofft too! These are great-looking, B. They are really cool and have a non rubber heel! Super cute Bella. Glad you kept them too! Super cute shoes Bella--how i wish i could still wear heels cuz I'd be all over them!! Really nice looking. I love comfy shoes and boots!! Im sorry to say that my bad computer skills "killed " the 40+ blog roll on my blog and i cant get it back again ! Some signs that are wrong ? is the message i get ! Please help ! Im proud to be a 40 + ! Glad you found such comfortable shoes. And Sofft shoes also come in lots of different sizes and widths. Nice. Gorgeous shoes...but I must say, it's the tat that caught my eye. Great ink! I like Sofft. I had a pair of Sofft strappy heeled sandals that I wore for years and they never once hurt my feet. Glad you decided to keep them. I have a pair of All Saints booties that are similar and I love them, too. Those look like they might even be more comfortable-- jealous! These are so cool - I love the foldover at the top! I find it funny when people talk about comfort, and I see a heel like that - it's a little high for me for all day, but I'd sure like to try! They look very 90s on top, modern heel in the back. Lovely! Yeo, those are sa-weeet! I think that sofft make some of the coolest, edgiest comfy shoes out there. I love their platform sandals for summer. I have a pair of Sofft boots, they are super comfy! Love your booties! Very cute! Soft, leather and comfortable are all great reason to keep these booties! Awesome booties, Bella. I love them. Sofft brand is pretty incredible and now I'm going to be on the lookout for those booties! Soft, cute and stylish?! Wow thats a winner all round. Wow! I'm seriously coveting those. How high is the heel, Bella? Love this brand, Bella! So cute. Would love to see how you wear these! Thanks for you kind RTs and comments this week! those booties are real cuties, Bella, and they look so comfy too! You had me at cushion...Running after kiddos in uncomfortable shoes is not my favorite! Love your new look my dear! i will be back for a better look... I can't wait to read your tomboy X! LOVE your... "dress to express"!!! I have looked everywhere for these. Where did you find them. They look great on your feet? Just love them. I need these for my collection. The ? was in the wrong place. They really do look good on you. dang those shoes are perfect!